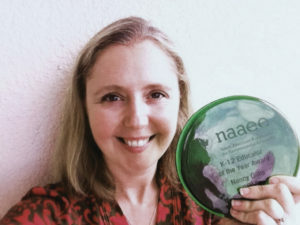 At the North American Association for Environmental Education’s (NAAEE) awards reception in San Diego, California, Nancy Gillis was recognized with The K – 12 Educator of the Year Award. This award is peer acknowledgement for Gillis’s efforts in promoting environmental education and utilizing the environment as a context for learning in her teaching. How did the NAAEE hear about Gillis’ superstar environmental teaching skills? Gillis won the Classroom Energy Diet Challenge’s (CEDC) Energy Educator of the Year Award for Central Canada in May 2015, a program presented by Canadian Geographic and Shell Canada. It was while Gillis participated in the summer CEDC workshop that her fearless, dynamic approach to environmental teaching shone through. “Nancy Gillis is a trailblazer in the field of environment education,” says Ellen Curtis, Director of Education with Canadian Geographic Education. “We felt her commitment to environmental literacy deserves the recognition that The NAAEE Educator of the Year Award can bring.” Here’s a sample of some of the environmental educational initiatives Gillis does with Cresthaven students. Students conduct waste audits and advocate to make changes to reduce waste and energy within the school. Students get involved in eco-innovation projects like designing and building green solutions such as solar desk lamps. Students are involved in projects to help and protect nature such as establishing a school pollinator garden, making solitary bee houses and designing and building bat houses. Students are engaged in special fundraising projects, such as designing and selling their own Eco-themed greeting cards, to support environmental causes and their own school greening initiatives. The students also learn about issues relevant to the community such as changes to a nearby oil pipeline. This issue spurred on Grades 2 to 6 students to produce a film called “Look What’s Coming Down the Line” which was featured at the United Nations World Environment Day Student Film Festival and placed runnerup for a KidsCan Press Award. Providing students with outdoor learning and opportunities to connect with nature is a priority for Gillis who takes her students on regular nature walks in the nearby parks and the East Don River Trail. Gillis embeds environmental literacy into her teaching throughout the curriculum and has helped lead her school in achieving Platinum status as part of the Ontario Eco Schools program. Deb Chapman is the Communications Manager for the Royal Canadian Geographical Society/Canadian Geographic Magazine.